We have been hearing about Lenovo’s next possible dual releases for too long now. 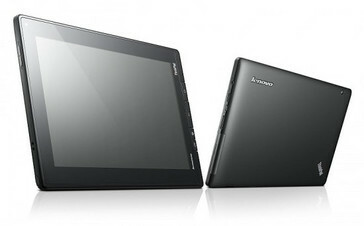 Netbooknew reports that the Lenovo IdeaPad K1 and ThinkPad tablets finally get their official photographs clicked. And they look photogenic, let us tell you! The Ideapad K1 shines in a blood red backside surrounded by shiny aluminum shade. The glossy 10.1” display panel looks cool, although a little too reflective for our taste. 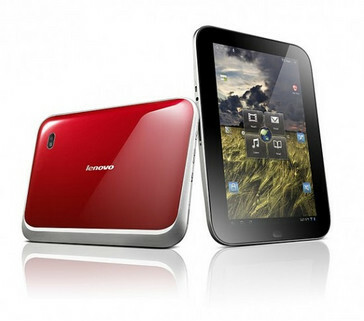 Lenovo chose to keep a glossy surface keeping the consumer segment in mind. The round edges give it a relatively sportier looks and the traditional ones. The primary camera on the back seems to have an LED flash. Full specs for the K1 are available now. The 10.1” display has a maximum native resolution of 1280 x 800 pixels. It is indeed a capacitive glass with multi-touch capabilities. There is an NVIDIA Tegra 2 (T20) system-on-a-chip doing the duty underneath that comprises of a dual-core ARM Cortex A9 CPU along with a Single-channel LPDDR2 (600 MHz) or DDR2 (667 MHz) graphics chip. This chip is in fact one of the more popular platform among the tablets in particular with portfolio including mighty names like Acer Iconia Tab A100 and A500, Asus Slider, LG Optimus Pad, Xoom, ASUS Eee Pad Transformer, Dell Streak 7, Toshiba Thrive tablet, Samsung Galaxy Tab 10.1 and T-Mobile G-Slate. Rest assured you are in good company! Looking exactly opposite of the K1’s consumer-centric look, the Thinkpad tablet tries to retain the typical no-nonsense business look that the brand has been carrying since IBM times. In fact it is almost like you have the Thinkpad netbook without the hardware keyboard. The matte display will be more legible that that of the Ideapad K1 – especially while out there under the sun. It also carries the same 10.1″ 1280 x 800 pixels capacitive touch screen but with stylus support. The stylus is particularly useful for signing forms or writing and drawing business-related data. Full specs are not known yet. No pricing and release dates are confirmed yet.